Nowadays Blu-ray is a new format that is on the way replacing DVD format as storage media for multimedia entertainment system. While it has started to gain popularity in digital home, but putting it in in-car system is still not happening. 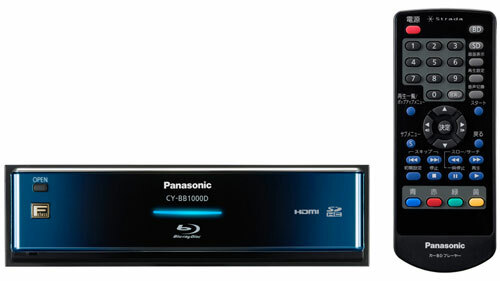 Good news now for those that are looking for one to be installed in their vehicles, Panasonic has just announced the new Blu-ray player recently and dubbed as CY-BB1000D, it is claimed to be the world’s first in-dash Blu-ray player in the automotive industries. The CY-BB1000D Blu-ray player is compatible with AVCHD and AVREC and equipped with a HDMI output that can be connected to its HD-capable companion, HX-3000D with a HD (High Definition) 1280 X 720 media playback at 7-inch display panel. Although it supports Bonus View content, but BD-Live content is not an option since it requires Internet connectivity. In terms of HX-3000D, it is designed in double-DIN that can be fitted well in standard vehicle with H.264 codec capability to decode and view from any compatible Blu-ray source. Further supported by 5.1 channel audio in Dolby True-HD and DTS-HD, it offers a great audio and visual experiences while driving on the road. Most importantly, it is enhanced with GPS (Global Positioning System) and includes an internal 80GB hard disk for storing media clips as well as external USB docking connectivity targeted for famous iPod and iPhone products. However, it doesn’t go cheap especially when bundled with all these high end features, the CY-BB1000D is expected to retail at $1000 while CN-HX3000D navigation system will be retailed at $3800. Both of them will be reaching Japan market space by September 10th 2009.